Through WorldatWork's workspan magazine, ICS applies scholarly research to practical issues. Click on the title to download a PDF of the article. Better understanding the role of compensation complexity should help inform how best to align shareholder and executive interests. If necessity is the mother of invention, can tighter labor markets spur innovative recruitment practices? Narcissism: For or Against ? Does paying top executives to achieve shareholder return actually improve firm performance? 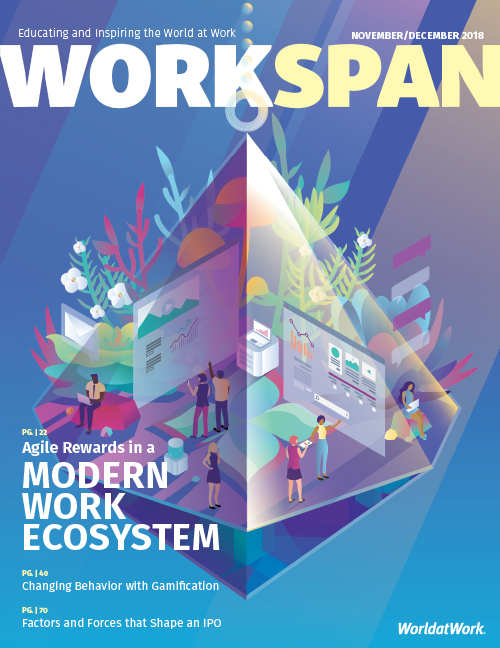 Linda Barrington discusses why older workers' pay declines after changing jobs in her latest workspan article, "Age, Total Rewards and Job Change." Stephanie Thomas, program director for the Institute for Compensation Studies within Cornell University's ILR School, shares her recent research on the interaction of performance pay and motivational language. Can allowing pets in the workplace help your organization attract talent, increase productivity or reduce employee stress levels? Does the residence of HQ (and associated high-paying jobs) matter for charitable giving? How much for the really tough jobs? How much did you tip today? Are you an early bird or a night owl? It matters. Stock options or more base pay? Which would you choose? Is performance better when pay only goes to the winner? Does employee downsizing increase top executive compensation? Is all talent at the top earning more? Are third place winners happier than second? Does Graduating in a Bad Economy Penalize Your Pay for Life? Is There Deadweight Loss in Holiday Rewards? Does More Education Cause Higher Earnings? Say-on-Pay votes? Most say "yes"
Does That Pay Practice Really Have Any Impact? Are your pay practices performing??? Which pay practices foster productivity? Should something be done about CEO pay? Which organizations provide optimum payment now or later? If you’re after money, sail a big ship. Most workers are unaware of their true cost to employers.